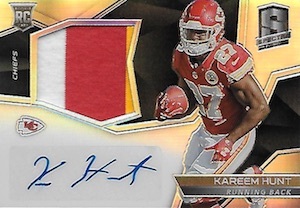 Entering its fourth NFL season, 2017 Panini Spectra Football is still a high-end release that opts for vivid looks and even colored ink as opposed to a more understated approach. Comparable to last year's set, the 2017 hobby box yield consists of four autographs and seven relics. Also known for its crazy parallels, options this year include Neon Green, Neon Orange, Nebula, which is new, and Neon Black Light, featuring white acrylic signatures. 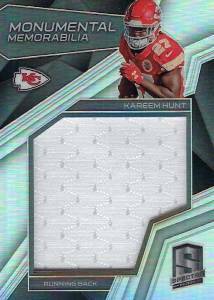 In addition to the expected base set, the 2017 Panini Spectra Football checklist offers the popular Rookie Patch Autograph subset. Each numbered to 99 copies, low-numbered parallels bring further rarity. 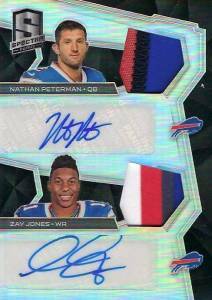 As far as the other options centered on first-year talent, the Aspiring Patch Autograph insert has a similar look to the horizontal RPA cards, while the Radiant Rookies Patch Signature line works with a vertical layout. 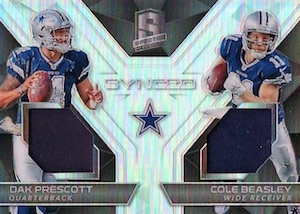 Just as the name indicates, the Rookie Dual Patch Autograph set puts two 2017 draftees on the same card, with signatures and relic swatches for both. These are numbered to 25 copies or less. However, autographed editions are not confined to just the 2017 rookies. Hard-signed Illustrious Legends highlights the best of the best from the history of the NFL. 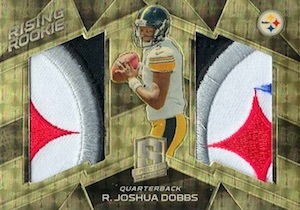 Another option, Attired Athletes goes the auto-relic route. 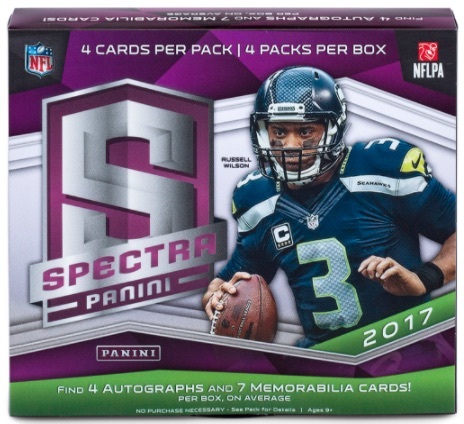 With seven per box, memorabilia cards remain a huge part of 2017 Panini Spectra Football. Themed sets include Catalysts, Epic Legends Materials, Rising Rookie and Triple Threats Materials. These also present parallel versions, including patches and prime relics. 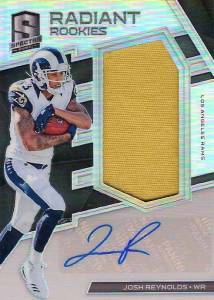 2017 Panini Spectra Football hobby boxes carry expected pricing of $300. PARALLEL CARDS: Neon Blue #/50, Neon Blue Die-Cut #/35, Neon Green #/25, Neon Green Die-Cut #/20, Neon Pink #/15, Neon Pink Die-Cut #/10, Neon Orange #/5, Neon Orange Die-Cut #/3, Nebula #/2, Gold 1/1. 29 cards. Serial numbered #/199. Shop on eBay. 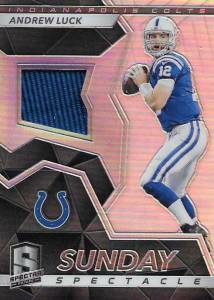 PARALLEL CARDS: Neon Blue #/75, Neon Green #/50, Neon Pink #/15, Neon Orange #/5, Nebula #/2, Gold 1/1. PARALLEL CARDS: Neon Blue #/75, Neon Green #/50, Neon Pink #/15, Neon Black Light #/10, Neon Orange #/5, Gold 1/1, Gold Laundry Tags 1/1 (Player's Logo/Shield/Swoosh). PARALLEL CARDS: Neon Blue #/50 or less, Neon Green #/25 or less, Neon Pink #/15 or less, Neon Orange #/5 or less, Nebula #/2, Gold 1/1. Joe Haden not found in Base, Neon Blue; Jay Ajayi found only in Gold, Nebula, Neon Orange. All subjects not included in parallel sets. View specific parallel numbering with the spreadsheet. 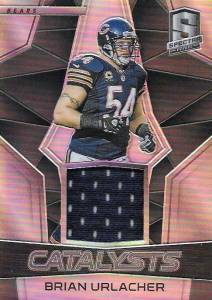 PARALLEL CARDS: Neon Blue #/50 or less, Neon Green #/25 or less, Neon Pink #/15, Neon Black Light #/10, Neon Orange #/5, Gold 1/1, Gold Laundry Tags 1/1 (Player's Logo/Shield/Swoosh). 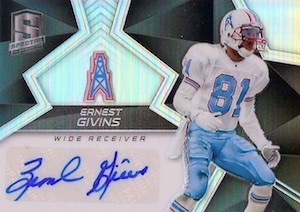 PARALLEL CARDS: Neon Blue #/50 or less, Neon Green #/25 or less, Neon Pink #/15 or less, Neon Orange #/2 (Tyler Ervin - #/5*), Nebula #/2, Gold 1/1. Eric Berry found only in Neon Pink, Neon Orange, Nebula, Gold. View specific parallel numbering with the spreadsheet. PARALLEL CARDS: Neon Blue #/99 or less, Neon Green #/25 or less, Neon Pink #/15 or less, Neon Orange #/3 or #/2, Nebula #/2, Gold 1/1. PARALLEL CARDS: Neon Blue #/20, Neon Green #/10, Neon Pink #/5 (Steve Young - #/4*), Nebula #/2, Neon Orange #/2, Gold 1/1. PARALLEL CARDS: Neon Blue #/50 or less, Neon Green #/25 or less, Neon Pink #/3 (Plunkett - #/5, Okoye - #/15), Nebula #/2, Neon Orange #/2, Gold 1/1 (No Namath). PARALLEL CARDS: Neon Blue #/99 or less, Neon Green #/25 or less (No Matt Ryan*), Neon Pink #/10 (Kessler, Wilson - #/15; Rodgers - #/7*), Neon Orange #/5, Nebula #/2, Gold 1/1, Gold Laundry Tags 1/1 (No Wilson, Ryan, Rodgers*). PARALLEL CARDS: Neon Blue #/99, Neon Blue #/25, Neon Pink #/15, Neon Orange #/5, Nebula #/2, Gold 1/1, Gold Nike Logo 1/1, Gold Laundry Tags 1/1 (Player's Logo/Shield/Swoosh). 10 cards. Serial numbered #/199. Shop on eBay. PARALLEL CARDS: Neon Blue #/99, Neon Green #/25, Neon Pink #/15, Neon Orange #/5, Nebula #/2, Gold 1/1. PARALLEL CARDS: Neon Blue #/99, Neon Green #/25, Neon Pink #/15, Neon Orange #/5, Nebula #/2, Gold 1/1, Gold Laundry Tags 1/1 (Player's Logo/Shield/Swoosh). PARALLEL CARDS: Neon Blue #/25 (Rodgers/Trubisky - #/10*), Neon Green #/15 or #/10, Neon Pink #/7, Nebula #/2, Neon Orange #/2, Gold 1/1. 20 cards. Serial numbered #/25. Shop on eBay. PARALLEL CARDS: Neon Blue #/20, Neon Green #/10, Neon Pink #/5, Neon Black Light #/3, Neon Orange #/2, Gold 1/1, Gold Laundry Tags 1/1 (Player's Logo/Shield/Swoosh). PARALLEL CARDS: Neon Blue #/99 or less, Neon Green #/25 or less, Neon Pink #/10, Neon Orange #/5, Nebula #2, Gold 1/1, Gold Laundry Tags (No Sherman*). PARALLEL CARDS: Neon Blue #/99 or less, Neon Green #/25 or #/15, Neon Pink #/10 (Cards #21-30: #/5*), Neon Orange #/5 or #/3, Nebula #/2, Gold 1/1, Gold Laundry Tags 1/1 (Player's Logo/Shield/Swoosh). PARALLEL CARDS: Neon Blue #/50 or less, Neon Green #/20 or less, Neon Pink #/7, Neon Orange #/5, Nebula #/2, Gold 1/1, Gold Laundry Tags 1/1. 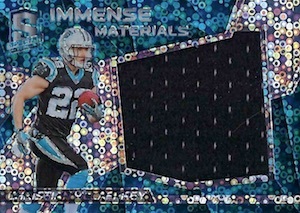 I just broke a case of this product and for the price it has way to many low end auto’s or jersey cards. Almost all the auto’s are sticker auto’s, and in a whole case only 3 of the top quarterbacks or runningbacks autograph cards, a DeShaun Watson, DeShone Kizer, and Dalvin Cook. The hall of fame or legends autographs we got in the case were Jim Otto and Christian Okoye. Also the case duplicated players really bad, such as 4 autograph jersey rookies of Mack Hollins. But for the price of the box this is a product I would avoid unless you like playing the slot machines, you may hit a jackpot but if you keep playing you’ll end up losing. From what I have seen this product is letting me down this year. Just not enough value for the price. Bought two boxes and didn’t get much. I have seen quite a few breaks and there’s not enough value overall. I didn’t buy any of this. But by rule of thumb Pacino values their boxes by hits excluding flawless and immaculate. $30 a auto and $20 a relic. This box 4 autos (120) and 7 relics (140)= 260. The box is out weighed with relics, when’s the last time you wanted to pay over $20 for a plain relic card? The box is not for people wanting value but probably artistic looks. 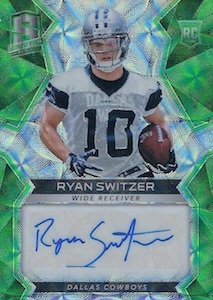 The neon cards and ink look cool but fall one per 4box’s… so? Ritzy looking cards. When I buy I always buy 2 boxes of a product. Can’t do a set as there were only 4 base cards in 2 boxes. Hit a 2/3 rookie jersey patch McCaffrey auto in one box and a Peterman rookie auto 1/1 swoosh in the other for my big hits. Rest of cards were better than average also. Hunt auto jersey, Watson and Kizer relics. Mostly parallel hits. Still a bit pricy if you don’t get a big hit but it is the same with any product.